These days, not always we want to take the smartphone out everywhere to receive a call. In adition to the evergreen risks such as theft, lost, modern smartphones are solid pain to hold and talk. Samsung Level U is lightweight, wireless, around-the-neck design and have in-ear buds (not exactly in the canal). We have many articles on headphone versus earphone, ear buds vs in ear to give an overall technical idea around these “private listenting” instruments. Samsung Level U really good addition for even their mid-range smartphones like Samsung J7 Max. There is significant improvement of sound from Samsung J7 Max compared to Samsung Note 9. Price of Samsung Level U not closest to huge sum if earphone niche is considered. Samsung Level U generally above average earphones, comfortable in-ears with poor noise isolation. It is good match even with the mid range smartphones like Samsung J7 Max – Samsung music play do play realistic, comfortable sound when settings is adjusted. The packaging is simple – a rectangular box with plastic mould to hold the headphone unit, 3 or 4 silicon ear plugs and a small booklet. The set has 4 buttons on the neck piece – a rectangular button to receive calls, play/pause music, holding it for few seconds turns on Bluetooth pairing function, on-off switch, other two buttons are for increasing and decreasing volume. There is a bicolor LED indicator and a USB port for charging (smartphone charger works fine to charge it). Samsung Level App available on Play store on Android smartphone. Depending on the model, it offers basic functions such as connections, displaying battery level, sound volume & settings tweaks. 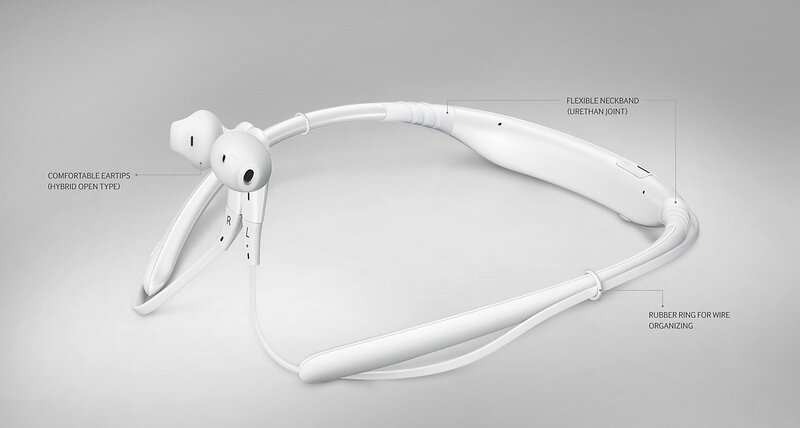 The earphone units has magnetic tips to prevent the neck band falling from the neck when plus are not on ears. Samsung Level U supports simultaneous multi-device pairing, support for both aptX and aptX(LL) but there is no NFC support. The sound, microphone are enough good to justify the price tag. However, there are simple designing flaws which makes the joints of wires with the neck unit at risk to torn away. The working range of Bluetooth connection is acceptable. There is no wired option to connect with the smartphone. Rechargeable battery get charged quite quickly and has an acceptable duration of working. For long journeys, a power bank is suggested to charge both the smartphone and the unit. The set is usable with laptop/PC and also television, home theater which has Bluetooth streaming option. No other brand is remarkably better at the same price range. At higher range, some earphones has the advantage of wired connection with the smartphone which probably better as an alternative option. Samsung Level U is enough good for regular usages including usage on long journeys. Audiophile quality can not be expected at that price range. Many things are missing with the offering primarily because of lack of competitors. This Article Has Been Shared 1894 Times! Cite this article as: Abhishek Ghosh, "Samsung Level U Wireless Earphones Review," in The Customize Windows, November 21, 2018, April 25, 2019, https://thecustomizewindows.com/2018/11/samsung-level-u-wireless-earphones-review/.